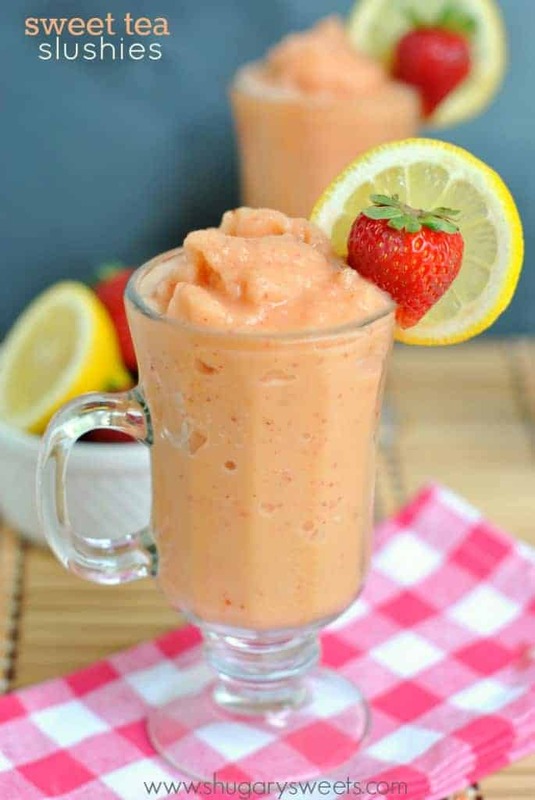 Serve up this summer slushie for your family and friends. 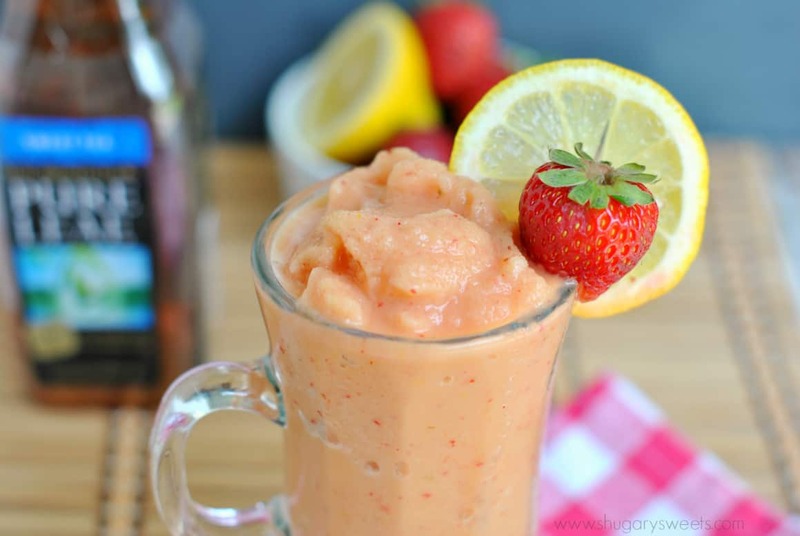 Or make Sweet Tea Slushies to enjoy by yourself! This week celebrates a special anniversary. Not a wedding. Not anything family related. It’s a personal one. A small victory for me. One year ago I gave up drinking pop (I’m sorry, do you say soda? Coke?). Okay, so for you this may seem trivial, but for me it was a huge deal. It would be like saying I gave up COFFEE. Haha, okay, maybe not THAT huge, but close. Very very close. As much as I love my coffee, I also LOVED pop. Diet pop. Before we went on our big 3 week roadtrip last August, I made the decision to give up pop. Forever. As in no more. And it turned out okay. I turned out okay. I survived. And in the process I found a new love. 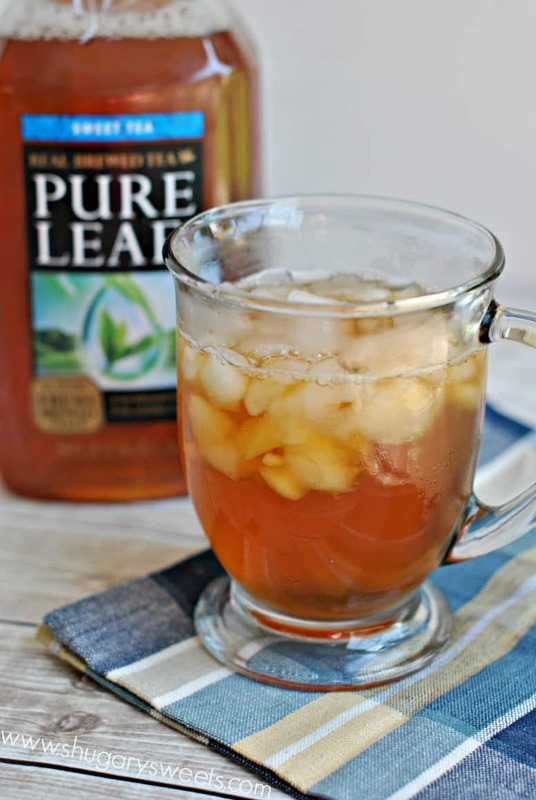 Pure Leaf Iced Tea. See, one day (I believe it was actually DAY 1 of our road trip) we stopped at a gas station. Which is usually when I would crave a diet pop, fountain drinks have that lure. So I opened up the refrigerated case and saw a bottle of Pure Leaf Unsweetened Iced Tea. I was hooked. Naturally, when Pure Leaf approached me about creating some recipes, I had a hard time containing my excitement. 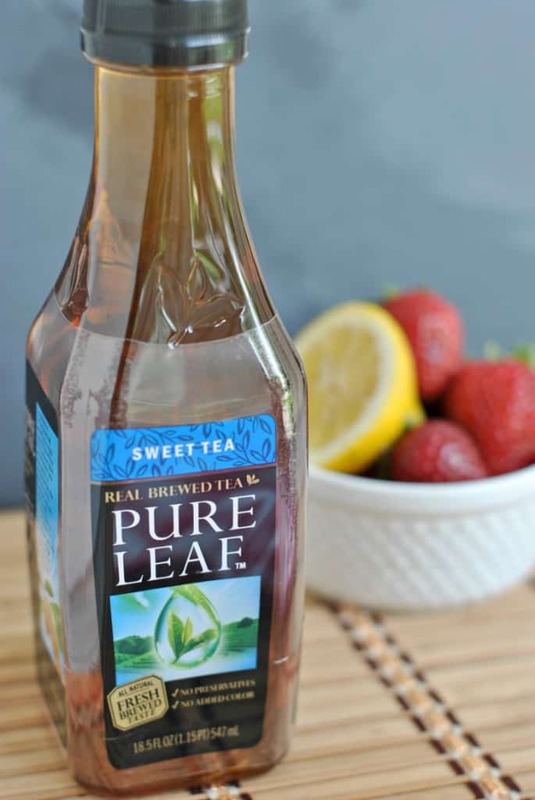 Because of all the iced tea I drink, Pure Leaf Iced Tea is my favorite. It’s never bitter and it’s made with natural ingredients. You guys, Pure Leaf kinda saved me. (dramatic much??). My love for iced tea and the refreshing taste helped me lose my craving for pop! And, Pure Leaf Iced Tea is made with freshly brewed tea and no preservatives; I love knowing exactly what is going into my body! 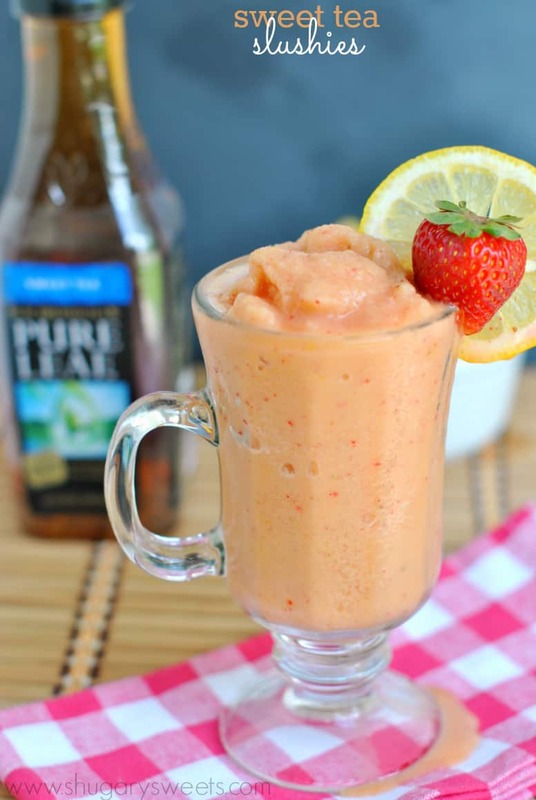 For today’s recipe, I wanted to show you that Iced Tea can replace pop in even your milkshakes and slushies! Have you ever had an iced tea float? I made one the other day using Vanilla Bean Ice Cream and Pure Leaf Sweet Tea. DELISH. But today, it’s about the slushie. Cause summer is just better when slushies are involved. You may remember this watermelon slushie from last summer. Today’s recipe is easy too. First though, do you ever freeze juice and tea in your ice cube trays? If not, you totally should. This keeps your summer drink from getting watery! Pour your iced tea over some frozen ice tea ice cubes and voila! Delish anti-watery drink. Or, use those frozen iced tea cubes in today’s slushie recipe. And add some Lemon sherbet and fresh strawberries. Off course, add more Pure Leaf Sweet Tea to get the right slushie consistency. That’s all you need for one of these frozen drinks! For every social engagement from fans on Pure Leaf’s Facebook or Tumblr, and use of the #loveofleaves hashtag on Instagram and Twitter, Pure Leaf will donate an additional $1, up to $50,000, for a grand total donation of $150,000. This will help provide 100,000 pounds of locally grown fresh fruits and vegetables for communities nationwide. C’mon Shugary Sweets readers, let’s raise those numbers and max out the donation!! Will YOU help? Also, visit TheLoveOfLeaves.com for recipes, household tips, DIY projects and daily inspiration, all while keeping an eye on how the campaign donations add up. 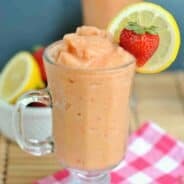 In a blender, combine all the ingredients above, and blend until smooth.